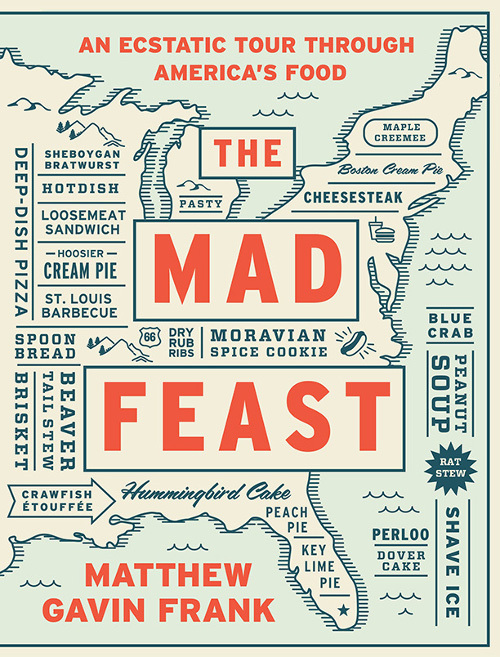 The Mad Feast: An Ecstatic Tour Through America’s Food, by Matthew Gavin Frank. New York, New York: Liveright, November 2015. 432 pages. $35.00, hardcover. Let me just say at the outset that The Mad Feast is a frenzied, delirious ride of a book. This collection of fifty essays travels around the country, through Matthew Gavin Frank’s mind, and into the nether regions of America’s culinary heritage. It’s an exploration of pleasure and sexuality, food and loss, slavery and cannibalism, obsession and fear. It’s a cookbook and food history unlike any I have read, and it takes a certain amount of trust on the part of the reader to make it, albeit scarred and scathed, through the book. Hold on tight, keep reading, and eventually you’ll find layers of meaning, bits of connective tissue, and moments of culinary and existential wonder. It’s a sometimes nausea-inducing trip with a maniacally brilliant writer at the wheel, but it’s a trip worth taking. The Mad Feast straddles the line between fiction and nonfiction, relying on a somewhat consistent narrator who interacts with composite characters, the most common of whom is someone called “Uncle,” a character who’s at once everyone’s and no one’s uncle. As I made my way through the book, I began to think of him as Uncle Sam—a tired, bedeviled, and jocular spirit of the country’s past, present, and future. There’s a chapter for each state of the union, and each chapter focuses on a signature dish of that state. But that’s about the extent of the book’s sense of order. Beyond that basic structure, it’s a stream-of-consciousness interrogation of etymology, death, desire, history, geology, and, sometimes, food. Each chapter examines and riffs on the etymology of the name of the state and the state’s representative dish, along with numerous strands of historical, geographical, geological, physical, and emotional narratives that eventually find themselves woven together in a crescendo of improvisation. At the end of each chapter there’s a recipe for the dish, submitted by chefs or residents of the states, though the book cannot be considered a cookbook. In fact, after reading each essay and following Frank’s explorations and dissertations and deconstructions, I felt little inclination to make any of these dishes. He exposes the simultaneously endearing and grotesque nature of all American food, and underlying these recipes are barely-spoken layers of cannibalism, disgust, and self-loathing. Passages like this make a kind of frenetic sense, especially in the context of the book’s other essays, which all do similar cartwheels and backflips, enjoying sleights of etymological and historical hand, careening just out of control before being reigned in by an authorial consciousness that lies just this side of sane. The Mississippi chapter, in fact, is one of those that cuts closest to the bone, one that both veils and reveals the “real” life of this author. Some of the chapters reach a fever pitch of etymological and historical banter, and it’s hard not to be impressed by the sweeping pyrotechnics of a writer in formidable control of his material. In the Mississippi chapter, however, there’s a darker and more personal tone than there is in some of the book’s faster-moving and freer-wheeling chapters. This chapter, called “Elegy for Arlo and Mississippi Mud Pie,” moves between the inky, unknowable layers of the Mississippi River and its eponymous pie, and it ultimately glides into even more unfathomably deep waters, describing how Frank and his wife visit the river to cast off the ashes of a miscarried fetus, Arlo. It’s a moving, haunting depiction both of the geology of the river and of this couple’s inexorable grief, and the story ultimately finds form in the enigmatical strata of the pie itself. This isn’t your typical cookbook, and nor is it your typical food history. It’s really neither of these. Rather, it’s a collection of lyric essays that just happen to start their journeys at the intersection of a state and a state dish. In the end, though, they go far beyond those parameters, into the complex territories of meat and heart, bodies and soil, meanings and mysteries.